Enabling physics is needed for multiple things: collision checking, gravity, bouncing, weight, velocity and more. To start, simply select one of your game objects or a group and refer to the Physics panel in the bottom-right corner. 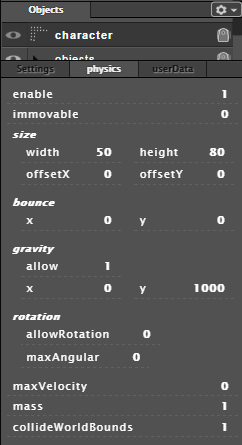 Physics is disabled by default and once you enable it by changing enable to 1, other options will appear. The same goes with immovable which must be changed to 0 (false) before the object can be moved and affected by gravity. Enabling physics to a group will affect every child of the said group at once. collideWorldBounds – whether the object can or cannot step out of the world bounds. If set to true, character will collide with the boundaries.